Just after our 20th wedding anniversary in 1992, my wife informed me she wanted a divorce. Although I was certainly fond of her, as a gay man in a heterosexual marriage I could neither blame her nor was I too upset. (I offered to help her pack.) By June she had moved out, joined by two of our kids who were still under eighteen. That left me, my mother, who spent half the year with me and half with my sister Louise in Florida, and my daughter, Jennifer, who had not been getting along with her mother and thought she might get along better with me. Meanwhile, in addition to working as a computer consultant, I was writing my first technical book and continued researching and writing Midnight Harvest, my novel about alien abduction. And, as described previously, I was continuing to learn that things common to abductees had happened in my own life. More bizarrely, some were continuing to happen. For example, another of my daughters, Karen, came to visit for a couple of weeks with her cat, Surf. 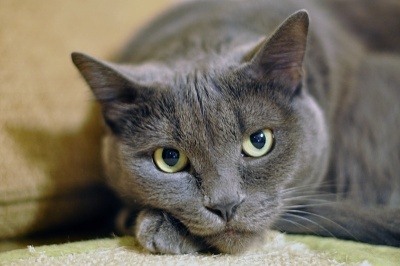 One night I was awakened from a sound sleep by the cat jumping on my waterbed. Oddly, it didn't turn or move about, just stayed where it was. (People accustomed to sleeping on an unbaffled waterbed can tell where anything has landed and its approximate size and location by the way the mattress shifts.) I was puzzled because I was certain I had closed my bedroom door before going to bed; but I was so groggy I decided what-the-hell and went back to sleep. In the morning, I found my door was still closed…and recalled that Karen and Surf had left several days before. But if it wasn't a cat that landed or pushed on my mattress…what was it? By itself, this wouldn't have proven anything. Heck, even with the other events, nothing is proven. But there were other events, and they began to build up a case that convinced me that some kind of High Strangeness was going on. One morning I awoke to find the fingertips of both hands were sore. When I inspected them, I saw small flecks of blood. It looked as though I'd had blood drawn from every finger with a standard lancet—except, I hadn't. Or, at least, it hadn't happened when I was conscious. Three days later, it happened again. And again, three days after that. Each time, my fingertips would hurt so badly typing on my computer keyboard brought tears to my eyes. Also, on several mornings I awoke with discolored, painless bruises on my upper arms. They looked like hematomas—common black-and-blue marks—except they weren't tender at all. I checked with my sister, Louise, who is a nurse; she told me that hematomas normally hurt; painless ones are a symptom of leukemia. I went to my doctor for a blood test; there was no sign of leukemia, and he had no explanation for painless bruises. He suggested I might have been sleeping on a lumpy mattress. That wasn't possible with a waterbed, of course. It began to look as if I not only had once been an alien abductee, but still was. Yet this was too fantastic to accept. I could play with the idea as a fantasy, but just couldn't swallow it as something happening for real. One day the thought popped into my head that, if I were being abducted, and if I became conscious on an alien ship during the process (as the literature I was studying suggested might happen), I could perhaps give my daytime self a message by marking my body. I might be able to cut myself, for example, by jabbing at something sharp. I wasn't sure I'd actually be able to do get up the nerve to do such a thing; I am extremely averse to pain. But it was a thought. A couple of mornings later when I took my shower, I felt a stinging burn on the knuckle of my right index finger which made me inspect it. It was the kind of burn you'd get if you held your knuckle against a hot iron skillet. I hadn't done that; I was microwaving my dinners. But it looked like that. And I was certain I had not burned myself the evening before. Like the bruises and the sore fingertips, this had somehow happened overnight. I showed the burn to Jennifer, who agreed it was strange. She is not the kind of person who is compelled to fabricate explanations for other people's eccentricities; but at least I had a witness that there even was a burn. We both judged it to require a good week or two to heal. Because of the divorce and the fact that I seemed to be taking the end of a twenty-year marriage almost too well, I had been seeing a psychologist for a few weeks. I wanted to be sure I wasn't just suppressing some emotional turmoil. I had shared some of my suspicions about alien visitations with him, but he was utterly unacquainted with the subject. I offered to loan him some of the literature I was studying, including a book by a renowned Boston psychiatrist named John Mack; but my psychologist wasn't interested. He developed the theory that suppressed emotions regarding my divorce was manifesting as hallucinations of aliens, and nothing could dissuade him of that, including the fact that I hadn't yet had any hallucinations. Except, that had been my plan, I realized—to mark myself on board an alien ship if I could. I just didn't remember doing it. Whether I did it or someone or something did it to me, it had happened without my now possessing conscious memory of it. In any case, it became a moot point. During the hours between my discovering the burn and my appointment with the psychologist, the burn healed itself. Jennifer and I kept checking on it; every time we looked, it was noticeably improved; and by the time I needed to leave, it had healed without a trace. I had read that people under hypnosis can be told the hypnotist's fingertip is a branding iron, and when touched with it they will actually blister. I asked the counselor if he'd heard of this—he admitted he had—and if such injuries healed more quickly than "normal" injuries. As far as he knew, he replied, they did not. I had to admit there was a logic to his theory. I wasn't broken up about the end of a twenty-year marriage; perhaps I should be. Perhaps I subconsciously thought I should be punished for being the reason the marriage ended; perhaps I really was injuring myself at night and confusing the result in the daytime with evidence of an alien abduction—certainly an effective deflection from taking responsibility for it myself! Yet this explanation didn't feel right. I'm not an abusive guy. I rarely even spanked my kids. I never hit my wife; I avoided fights in school. And I don't like pain. I don't smoke or do drugs and rarely drink. It was hard to imagine there was some sort of self-destructive other inside me that had waited all these years to manifest itself. There was also the fact that I knew my being gay was at least one factor in the dissolution of my marriage. I hadn't been cheating on my wife but certainly I hadn't been as physically attentive as she deserved. I regretted it but didn't feel guilty because I knew being gay wasn't a choice—I had always been gay; in my innocent twenties I hadn't had a word for it and hadn't thought that would be a reason to not be like everyone else in the world and get married. So there really wasn't anything to punish myself over, even subconsciously. 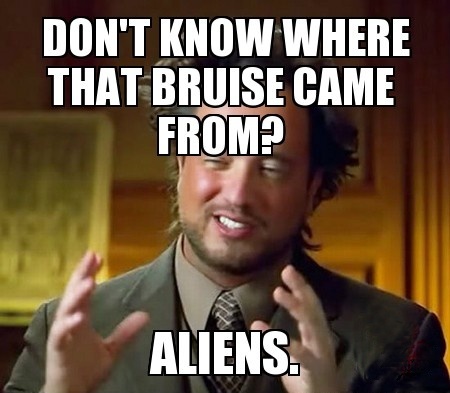 And even if I did bruise myself, why would the bruises be painless? 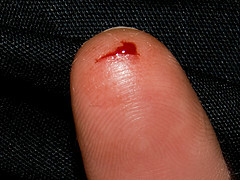 How could I prick my fingertips when I didn't own a lancet or even a sharp knife? And how could I get up at night and heat something to burning temperature and burn myself with it and then put the implement away without Jennifer or my mother noticing—especially my mother, who slept with her door open and got up to go to the bathroom every fifteen minutes? There was also the fact that so many weird things had happened to me and my sisters that defied explanation—yet were consistent with the histories of other abductees. Months passed. Jennifer returned to Virginia. Mom and I moved into a nicer apartment, a townhouse, on a hill. I received offers to teach one-week Windows programming classes around the country and began doing that full-time. My ex-wife was doing well, and I had begun to date men—and was having a great time doing it. I took Mom on road trips around New England. The strange occurrences followed me, but they didn't actually impact my waking life. With one book published and a contract for a second one, if my sanity was in question it wasn't preventing me from becoming a "success" in the generally-accepted, material sense. And then, one day in the fall, everything changed. They say "seeing is believing." By the time the following winter was over, there'd be evidence for anyone to see that someone or something was, truly, entering my home at night. Please note: I did not take pictures of my burns and marks. In fact, I snickered at people who suggested I should. "What am I going to do, sue the aliens?" I would laugh. But now, looking back, my not taking those photos, when I take pictures of absolutely everything, is clearly out-of-character for me and therefore, in itself, suspicious. The ones you see on this page were found on the Internet, but do match my memory of what the marks looked like.